Looking for Bill of the Birds? This post is for all the ivory-billed woodpecker seekers out there, whether they slog through bayous or dream from their chairs. As you know, I carry my camera wherever I go, and I've gotten pretty fast on the draw, shooting marginally acceptable to OK to pretty good pictures of the jittery likes of warblers and wild turkeys as well as mushrooms, butterflies, blowfly larvae, and rainbows. But there are some times when you can't get a picture. Naturally, they are the times when you'd most like to have one. Hence the dedication of this post. On my last day in the Upper Peninsula of Michigan, I was driving south on Route 123, just north of its intersection with Route 28, on my way from Paradise to Sault Ste. Marie. Several animals crossed the road, bounding and running, perhaps a quarter-mile up ahead. I didn't see much remarkable about the first two; I'm assuming, since they didn't catch my eye, that they were deer, but I couldn't swear to that, since my attention was focused like a laser on the third animal. The first two animals were darting and zigging erratically as they ran. The third was loping, a kind of rocking-horse gait, taking a more direct path, different from the other animals'. It was very long-legged, with a longish neck held erect, and pricked ears. A bushy tail, held low at a 45-degree angle, flowed behind it. It was solid, coal black. I believe it was chasing the first two animals. Whaaa? Not my photo, though I wish it were. This is a National Park Service photo. But it's exactly what I saw. Aggggghhhh! It was more than twice the size of any coyote I've ever seen, and entirely too dark. Good of it, to be a black morph animal; no confusing that with a little blonde songdog. Gasping, I realized that I had just seen my first timber wolf. I slammed on the brakes as I whizzed by where it leapt up a small bank and disappeared in the yard of a deserted log cabin, backed by extensive woodland. I backed up, fishtailing wildly, and pulled into the driveway, looking all around me at the woodland edge, hoping hoping hoping to catch another glimpse of my life wolf. The woods were silent, giving nothing away. I am sure it wheeled around, panting, in dense cover and was watching me. I scanned with my binoculars, looking hardest where it's hardest to see. Nothing. That is how the wolf would have it. Shaking, exhilarated, I drove on another half-mile when I saw a middle-aged couple with trash bags, picking up litter along the roadside. They looked kind and were dressed for the weather. I figured they lived there, to care that much, and I was right. I pulled over and rolled down the window. "Excuse me. May I ask you a question?" "Could I have just seen a wolf?" "OHH, yeah!" the man replied, smiling broadly. "They're here, even though the DNR will tell you they aren't. They don't want to admit it. But they've been killing our neighbors' dogs two roads over, and when they showed the DNR biologist the tracks he denied it. 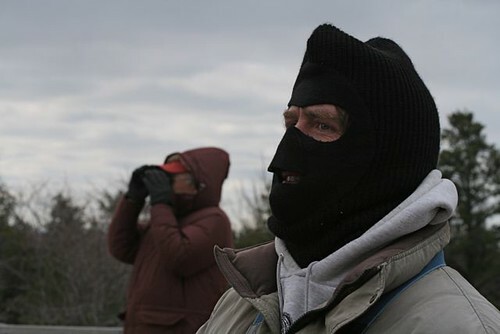 They (the biologists) don't want them here if they don't have radio collars on." "So, do you hear them howling?" "Oh, yes, and coyotes too. You can tell the difference!" I described my sighting and they smiled and nodded. Yep. That was a wolf. It was really nice to have confirmation from people who live right where I saw the animal, people who know enough and care enough about nature to pick up others' refuse along the road. 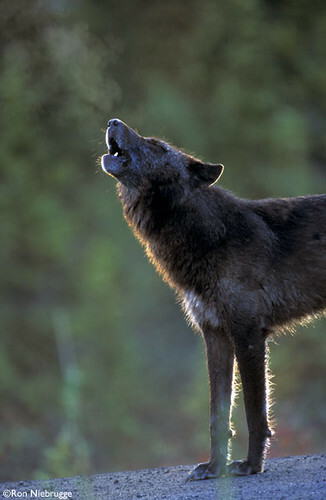 A friend with extensive UP experience advises that there is an estimated population of 500 wolves there at present. He's seen them in Canada, but never on the UP, and he was just about as excited as I was to hear of it. That I was given to see one of the few, and a coal-black one at that, seemed like an extravagant gift, a surprise party for my soul. 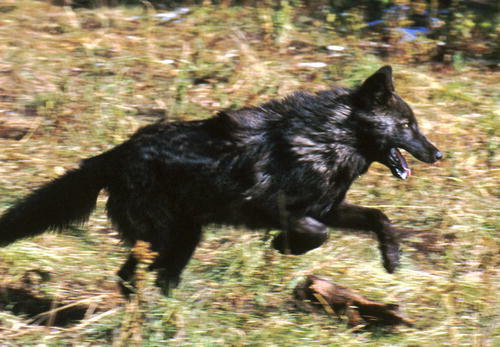 Photo of a black Denali wolf by Ron Niebrugge, at wildnatureimages.com. Used by permission of the photographer. Thank you, Ron and Janine! Thank you, Bob Pettit, college biology professor, WPBO board member and hardworking 20th Anniversary Spring Fling organizer, for inviting me to Michigan, for taking good care of me wherever I went, including feeding me pasties, and for arranging to have a wolf chase a couple of deer across my path as I left. I know you had something to do with it. You arranged everything else. 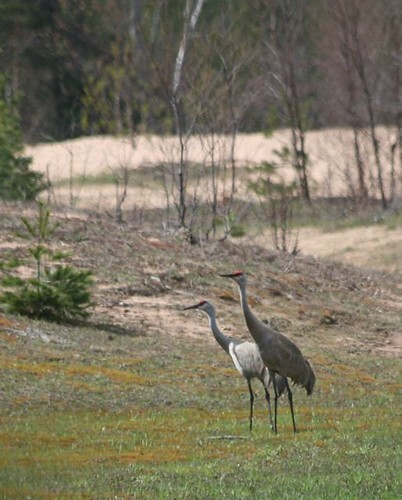 Long live Bob, the Whitefish Point Bird Observatory, the Spring Fling, the little cedar in the waterfall, the ivory-billed woodpecker, and the coal-black wolf on Route 123. 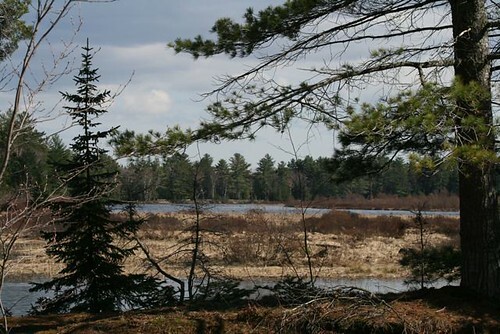 In "The Song of Hiawatha" there's a reference to "golden waters." Wipe that smirk off your face. 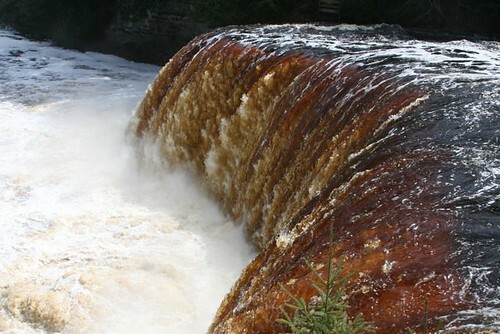 It's a reference to the cola-colored effluvia that flows through Upper Peninsula rivers, dyed by the tannins in hemlock needles. 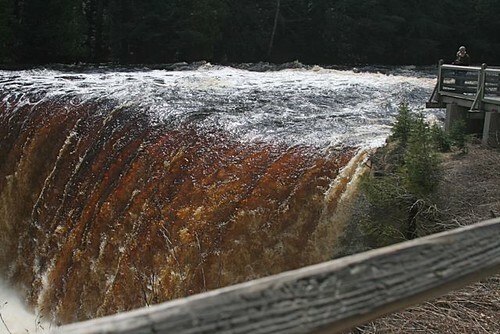 Nowhere does this color impress more than at Tahquamenon Falls, the second highest falls (after Niagara) east of the Mississippi. 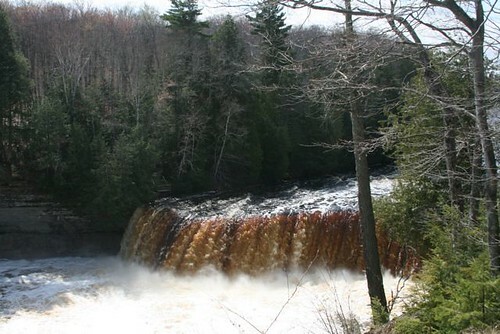 Loggers who sent their hard-won trees down the Tahquamenon River wept when they saw old-growth trees "reduced to matchsticks" by the power of the falls. I was there simply to gawk. This is one impressive piece of water. Photo by an unknown Japanese tourist who asked me to take his picture, so I hit him up for mine. Yes, it was that cold. It's hard to convey how impressive these falls are in a still photo, without the roar and the flying spray, without the immense scale. Getting a bit farther away, so the mature trees are in the picture, helps. I was impressed by a lone spruce, growing with its feet practically in the falls, and apparently doing all right. 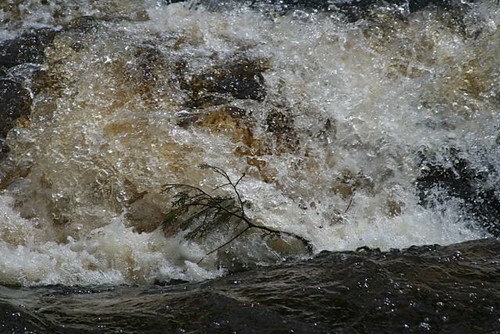 But I was even more struck by a tiny white cedar sapling, growing IN the falls. 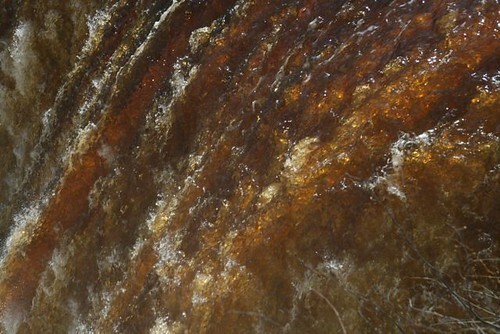 It was buffeted by the flume, coming up every few seconds for a breath of air. I couldn't believe it not only germinated there but survived that punishment, day in and day out, all night long, too. But it was alive. Ever feel like that little tree in the waterfall? Maybe the next time I visit, it will be up above the tumult, growing strongly up into the sunlight and air, like the spruce. Hang in there, little tree. 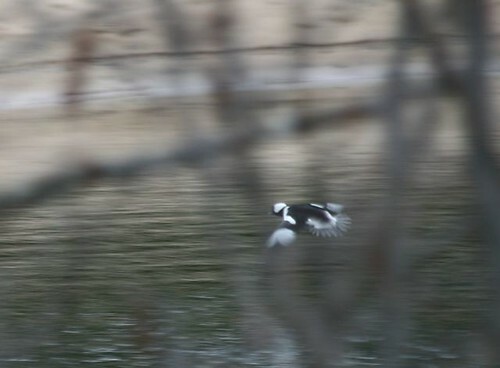 It's not very often I get to behold a life bird in North America any more. The last one was a female black-backed woodpecker in the mountains outside Santa Fe, New Mexico, last November 2007. That species, like the related three-toed woodpecker, had eluded me, well, all my life. I was hoping, but not very hard, to see another life bird in Michigan. I wasn't hoping hard because I've been skunked before, trying to see it in Maine. 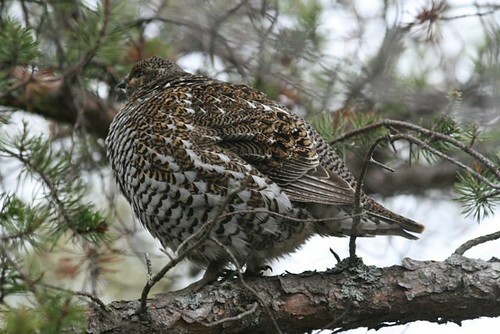 Gosh, it was great to be led right to a female spruce grouse, just as it was getting dark outside. 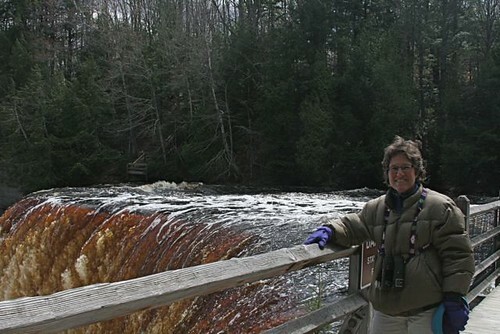 I'm grateful to Mike Sefton, a longtime board member of Whitefish Point Bird Observatory and editor of the WPBO Migrant, for taking the time to find her for me. Groups of happy festivalgoers had been enjoying the sight of her all day. 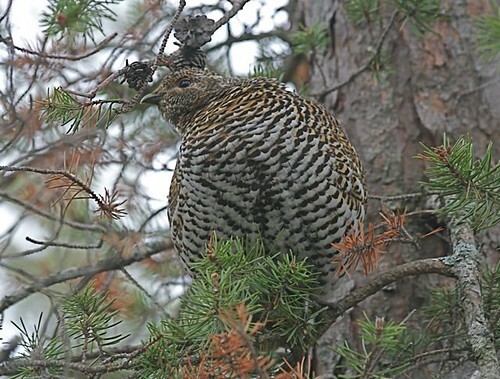 Mike wound his way through what was to me a featureless dune forest to find the cryptically colored hen grouse huddled in a pine. 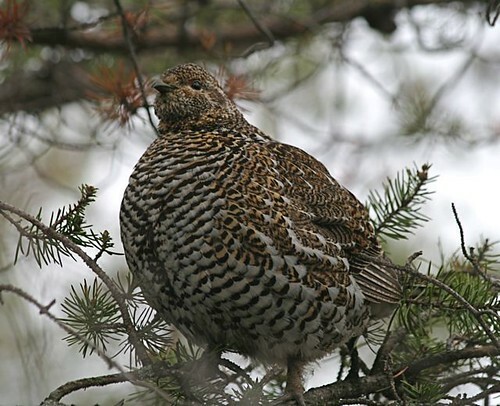 We had no sooner emerged from finding her than another birder asked, "Did you see the spruce grouse?" and Mike turned right around to take her to the site. What a kind thing to do. Spruce grouse are pretty cool customers, and they don't seem to mind going about their business with an audience. But calling them "fool hens" doesn't seem fair. A gorgeous little cantaloupe of a bird, her markings perfectly define her form. Such exquisite colors and patterns she shows. I wasn't in the least disappointed that it wasn't a slate-blue male. What a nice life bird to end a good day in the April cold of the Upper Peninsula. New Blog Alert! Please stop by my neighbor Jane's blog for lovely horses and the cutest spotted donkey, for tales of life on her farm and her gorgeous hand-hooked primitive-themed rugs, which are anything but primitive. And while I'm at it, please check out my neighbor Beth's blog for frequent posts on her ossum, multi-layered paintings and cyanotypes. Whipple, believe it or not, is a teeny-tiny artists' colony. We make up for our small numbers in large talent. I've added links in the giant blogroll to the right. 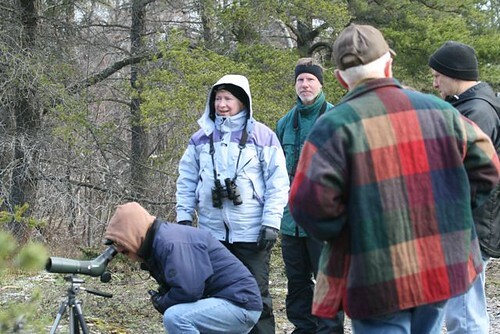 Back in the pines on Whitefish Point, birders attending the festival were clustered happily around a major find. You had to kneel to see it, the pine was so thick with branches. 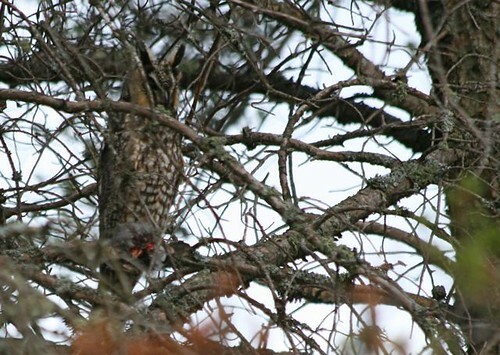 It was a long-eared owl with prey. 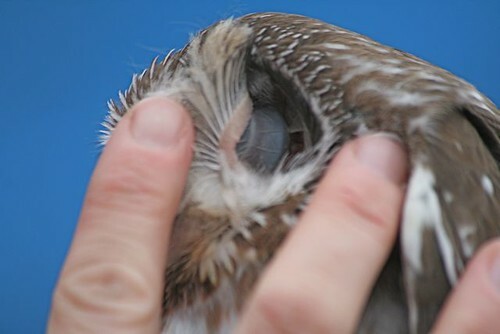 Close examination through the scope revealed the russet flank streaking of a saw-whet owl in the mess in its talons. Bummer. But that's what big owls do to smaller owls. LEOW's themselves often fall prey to great horned owls. And so it goes. 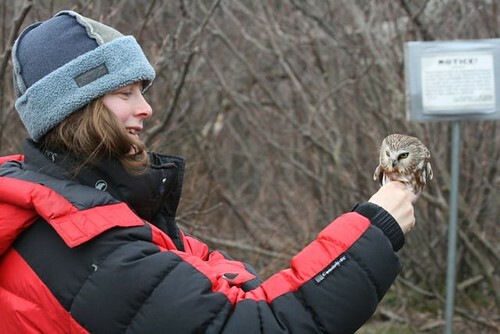 Another saw-whet owl who considered himself fallen on bad fortune, I'm sure, was in the gentle hands of Nova Mackentley, acting co-director, with Chris Nery, of WPBO. 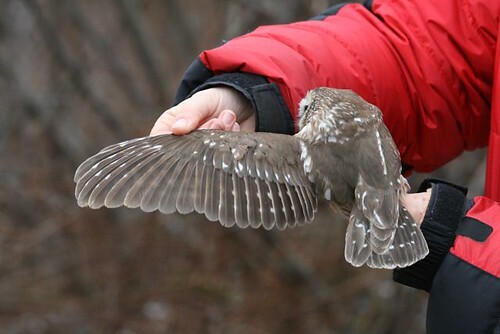 Two years ago, they started a summer banding program that illuminated an enormous movement of juvenile saw-whet owls that no one knew about until they started playing tapes next to mist nets. 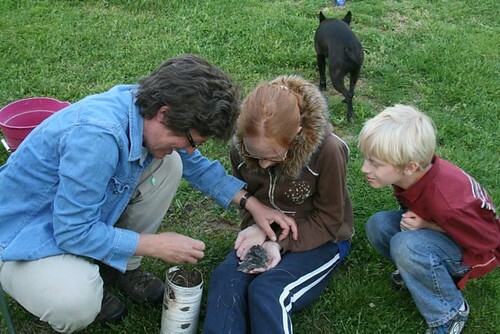 We're learning volumes about these tiny owls thanks to Nova and Chris' efforts, and those of the volunteers who help them. 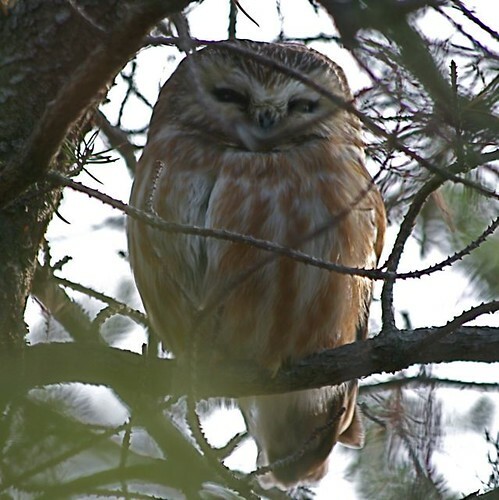 To band saw-whet owls, you have to stay up all night. 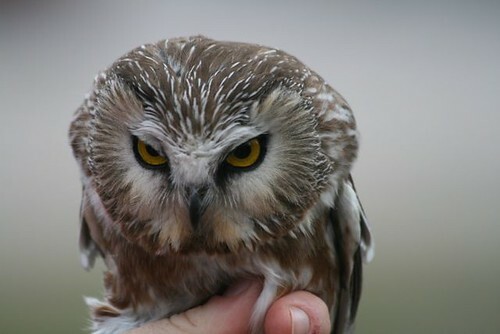 And consider this: they've caught nearly 1,000 saw-whet owls at Whitefish Point this spring alone!! That's a lot of coffee, a lot of sleepless nights and bleary days. I am too much of a weenie to band saw-whet owls. This I believe. With its wing stretched, the banders could tell its age. This is a second-year bird. As long as we were annoying the owl, I asked if I might take a peek at its ear. Wanna know what the Science Chimp really, really loves about this picture? That makes her jump up and down, pant-hoot and throw bananas at the ceiling? Well, the bluish bulge inside the ear is actually the back part of the owl's left EYE. Yeah. You're looking at its eye, inside its skull, thinly covered by inner ear skin. Owl eyes are so huge that they are quite vulnerable, so they're protected by bony sclerotic rings, and fixed, immobile, in the skull. This is why owls turn their heads to look at the tiniest thing--because they can't move their enormous eyes from side to side or up and down. And I discovered that you can see an owl's eye by looking in its EAR. Which I didn't figure out until I uploaded the picture and wondered what I was actually seeing. Having skinned a few owls, I realized that I was looking at the bony sclerotic ring. Eee! Eee! Eee! I have to go lie down now. A heavily ticked-off saw-whet owl. Good thing there isn't a smaller owl in the East. It'd get eaten. With all thanks to Nova, I prefer my saw-whets on the hoof. And not far from where one had been turned into dinner, and another into an ear model, there was one who was able to rest just a bit before flying north over Superior. Sleep well, little owl. Soon enough you'll be away from all this hubbub. Thanks to everyone who wrote in about Ruby. You're all so nice. It helps. The impact shook the floor under my feet. A bird had hit the window of our downstairs bedroom—a big bird, and from the force of the impact I knew it would die. After 15 years in a house with big windows, you learn such things whether you want to or not. She’d been coming to the back deck railing for three years: Ruby, a red-bellied woodpecker with two scarlet feathers in her gray forecrown. By these two small feathers I knew her, named her, and allowed myself into her world. I knew her mate, the male with wide black bars on his wings, and red feathers pulled down low over his eyes like bangs. Ruby waited for me every morning in the weeping willow, watching me at my morning routine, waiting for the mixture of peanut butter, cornmeal, oats and lard that I made and put out for her every day. I knew the sound of her voice and she knew mine, flying to the deck railing in expectation when she heard me first thing in the morning. I knew that when she hit the window she was feeding a brood of young in the woods behind the house. And here she was face down in the painted ferns beneath the window, stretching her wings one last time. I looked down on myself, doubled over in grief with a dead woodpecker in my cupped hands. Another bird might hit the window; so many have, to be cradled with an abstract and fleeting sadness before I buried them. But I knew this woodpecker. It wasn’t just another bird. This still-warm body in my hands was Ruby. I listen to reports from China every afternoon. Tsunamis, cyclones, earthquakes; the sheer scope of their destruction can numb us, cast us into the realm of the surreal, our ears closed and our minds floating away. In one, I heard a doctor speaking in halting English about the flood of patients he was seeing, most of them living in tents or under tarpaulins, all of them showing the effects of exposure and inestimable loss. He spoke matter-of-factly about his efforts to help as many as possible. At the end of the report, it was revealed that the doctor’s 26-year-old daughter had been lost in the earthquake; that he was working doubled over by his own grief, the greatest a parent can know. I pulled my car over, laid my head on the steering wheel, and wept. In a classic children’s story, the Velveteen Rabbit becomes real when a boy loves him enough. The toy, tattered from too many hugs, sheds its threadbare skin and leaps and gambols at night with real rabbits in a moonlit meadow. So do stricken people in a far-flung land, and yes, even woodpeckers, become real in our minds and hearts. In the end, I think, it’s better to have listened for their voices, to have allowed ourselves into their world, to sit down sometimes and weep for them. My last photo of Ruby, taken May 22, 2008. 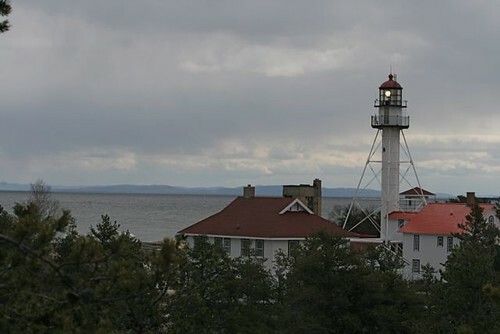 I was in Michigan to speak at Whitefish Point Bird Observatory's annual Spring Fling at the end of April. These are hardy people, with a different way of defining "spring" than we have down here in subtropical Ohio. They go by the calendar, not by the weather, and if the calendar says it's spring, well then it is. They go out. I love nautical disaster art. I find myself wondering what it might be like to look at a beautiful work of art, having lived through a disaster. Hey, it wasn't teal blue out there. It was PITCH BLACK and you couldn't see your hand in front of your face. But that's a really nice painting. 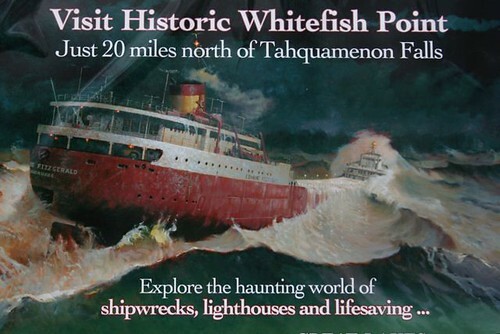 Whitefish Point is famous as the place where the Edmund Fitzgerald went down, taking 29 souls with it. This billboard is for my friend Grady, who loves shipwrecks most of all. Well, at least he did when I saw him last. He may have moved on to trainwrecks by now. 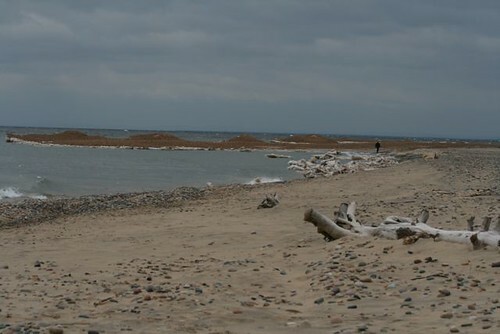 Among birders, Whitefish Point is famous for being a fabulous migrant trap, welcoming tired birds who've winged across Superior in the fall, and stacking up apprehensive birds (especially raptors) who don't much feel like facing the crossing in spring. Either way, it works real well for birdwatchers. I spent a fun afternoon watching hawks on the WPBO platform. A goshawk made my day! Sandhill cranes breed sparingly here. I was lucky to spot a couple of pairs, prospecting for nest sites. 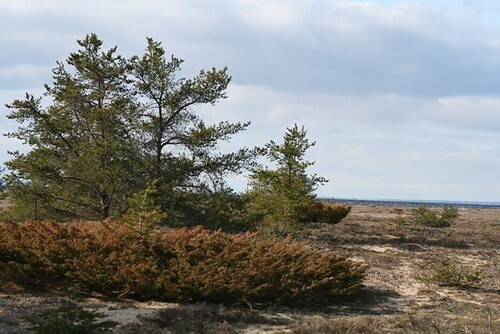 But it's the pines along the shore that hold the big treasure for birders. I had to keep reminding myself that I was not on a beach in Cape Cod, so similar was the vegetation. There's something disorienting about not having the tang of salt and fish in your nostrils when you're walking on dune vegetation. 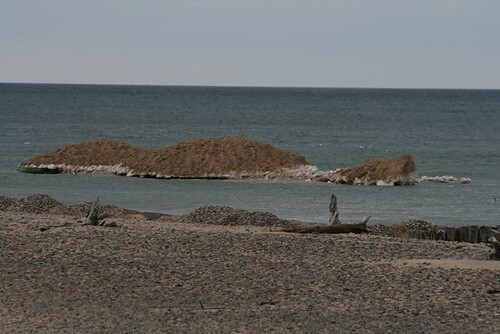 Looking out at Superior, I got a graphic demonstration of how shifting lake ice can plow up gravel and make landforms. It was like seeing a glacier in miniature. Here, a tiny moraine. When glaciers plowed along the land, they picked up ridges of gravel and sand. At their terminus, they piled up these deposits as they melted. The same thing's happening here, on a miniature scale, and seasonally. pockets were heavy when I left. 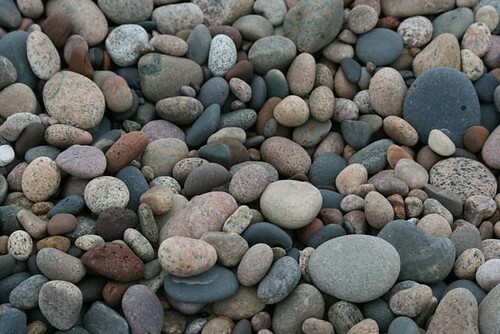 The more closely I looked, the more beautiful the stones became. I couldn't get over the mix of blue, pink, flecked granite, and terra cotta. Phoo. Imagine having that in your landscaping, or your aquarium! Pebble lust. My friend, festival organizer Bob Pettit, told me of seeing people staggering out with bagsful of the lovely water-worn stones, even though they're not supposed to. You get the feeling that people have been here for a very long time, and in the cool temperatures and acid conditions, their traces linger. Here's a Model A fender, the same kind I used to sit on as a child, clinging to the headlight strut, as my friend Billy Jones drove us around the neighborhood in the evening. 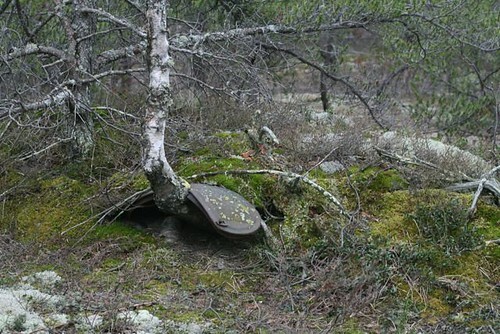 I wondered if there might be an entire Model A in that hummock under the birches. I was soon to find out that the dune forest hid even greater riches. 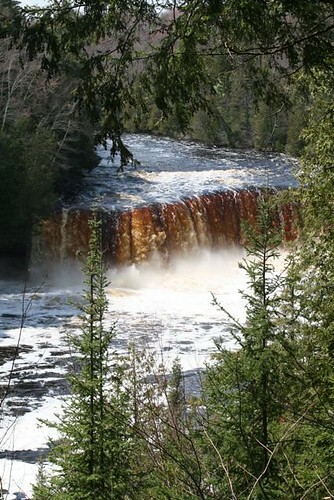 It's taken me awhile to get to my Upper Peninsula trip that happened at the end of April. I've wanted to, but the lilac was blooming and the asparagus was 'sparaging (still is!! Had another pick this morning!) and the birds were coming through and it seemed like it could wait. It was a trip straight back to winter. A pattern is emerging with festivals I've attended this spring. "It was SO GORGEOUS until you got here! And then it started to (insert noxious precipitation here)! Ha! " At Paradise, Michigan, the word was snow. Cold also got used. That was OK. I had packed my down parka, hat and thick gloves. I was layered to the max. Even had my jammie bottoms on under my jeans, just as April was turning to May. Having survived a snowy weekend in May 2007 in Chequamegon Bay, WI, I knew the drill. Those Great Lakes--those huge inland seas of ours--are cruel mistresses. The trip started auspiciously, with an obliging group of gulls. Since it was the first bunch of birds I came across after leaving the Sault Ste. Marie airport, I pulled over. I was birding now. Even without my Sibley, I knew this lesser black-backed gull when I saw it. 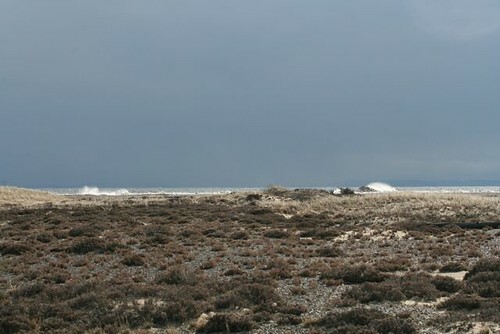 The pale-mantled birds in the upper left section of the picture are all herring gulls, the uppermost bird being a second-spring bird. The small pale-mantled bird in the lower right corner is a ring-billed gull. 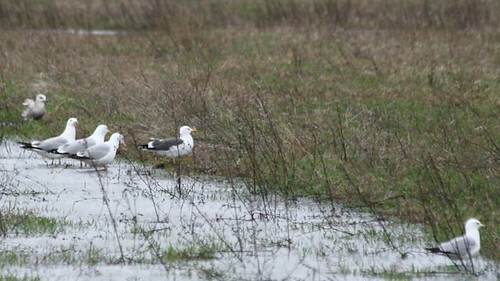 But the small dark-mantled bird with yellow legs and a red spot on its bill is an adult lesser black-backed gull. Whoo-ee. Good start. 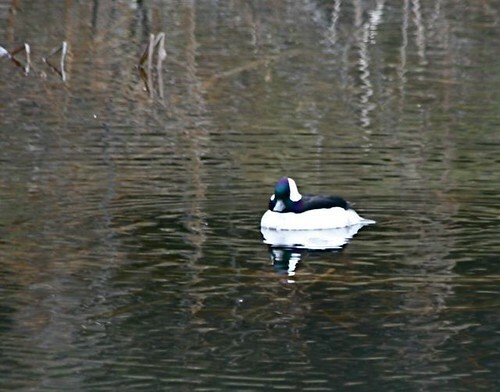 As the forest began to close around me, I found a male bufflehead in a dark roadside pool. He took flight, but only after I was able to admire and capture the oily teal and rose sheen of his puffy head. He looks like he's wearing a powdered wig. Maybe I watched too many episodes of John Adams on HBO. 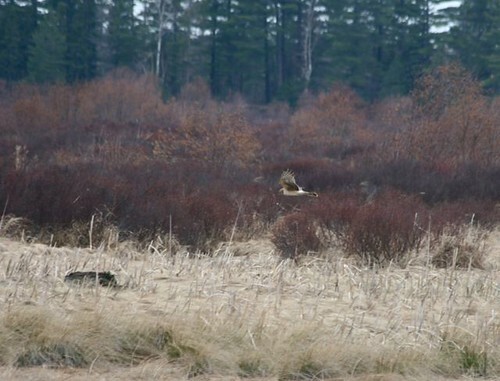 A female northern harrier made a Cindy House painting as I came out onto Whitefish Point. Yes. I was finally birding. 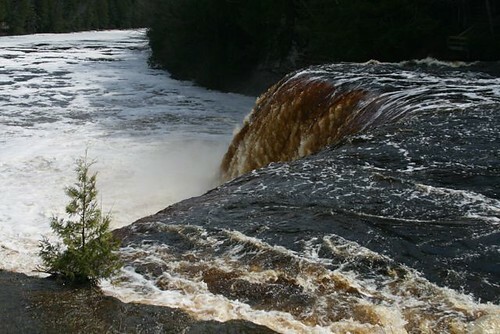 I can't wait to show you all the wonders of the U.P. Blogger hasn't let me post photos for two days running, but I spent an evening uploading via Flickr. Thank goodness for Flickr. It's a couple of hoops and about five extra clicks per photo, but at least it lets me in when Blogger is having its period. I haven't figured out how to keep the photos from flopping over my template borders. Sorry about that. Later: OK, Kyle, I'm trying your suggestion about adjusting the width to 400 in HTML (it was showing a width of 500). WHOOT! It works! Thank you! AI fans: I want David Cook to win, but I'm predicting that Lil' Oop Oop will prevail. Update: I'm so happy to see David Cook win. What a sweetie. Hope he keeps his head in all the hoopla. Hope he can ignore most of what the industry tells him. force. 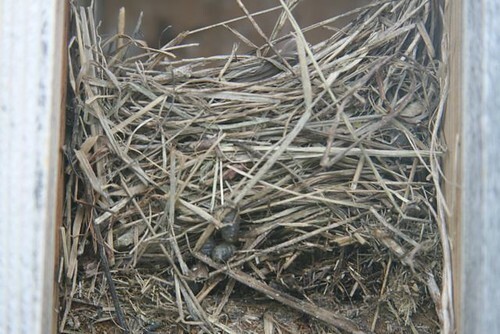 During the day they retreat into the nest, so nobody can see them to preen them off. Eeeeyew. You can see the gray larvae in the lower third of the nest, and the yuccky wet layer of blowfly- processed bluebird blood below that. After awhile you can smell them as soon as you open the box, and you know when the nest needs to be changed. This is a bad infestation, 80 or more. 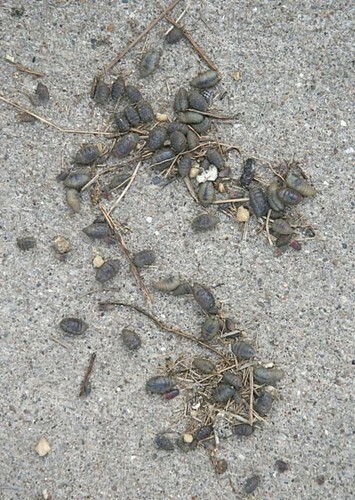 I put the infested nests in a pail and take them to the driveway cement to count larvae. 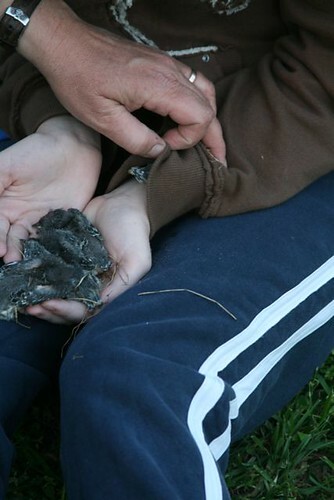 I've seen a load like this contribute to the death of broods in the kind of cold, rainy weather we've been enduring, when the parents can't find enough food to offset the blood loss the young birds suffer. 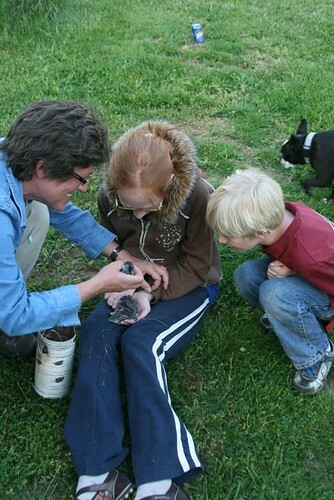 But you can't use pesticides around baby birds, whose tissue-thin skin and high metabolisms make them extremely vulnerable to poisons as seemingly innocuous as pyrethrins and rotenones. I won't even talk about bluebirders who swear by Sevin dust. They're out there, merrily dusting their boxes with pesticides, saying it's the only way to go. And I think that's a terrible thing to contemplate, much less to do. 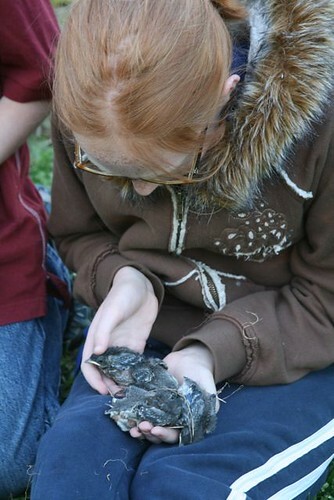 In one of our organic bluebird nest checks, Phoebe volunteered to hold the babies while I fashioned a new nest for them. stay in the box. Times like that, you have to stuff a sock in the box entry hole, give them a half hour to settle down, and then quietly remove the sock. But sometimes even that won't work, and the babies spill out and hop around on the ground, where their beleaguered parents do their best to feed and protect them. You don't want to mess with bluebirds after Day 12. Wuh-oh. They're starting to scatter. Wait. There were five before. 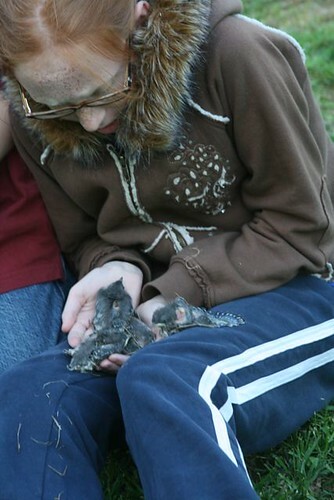 Phoebe began giggling helplessly as a clammy little bluebird made its scritchy way up the sleeve of her hoodie. I retrieved it from its nice warm lair and replaced it in the new nest. You little goofball of a baby bluebird. Pretty good thinking, though, to hide like that. Notice how Chet Baker patrols around without bothering anybody. I know. It's not a real Chetfix. But I figure even his receding form is better than no Chet at all. Today's hiatus is going to be happening more in June. There will be times when I can't post. I'll do my best, but don't be surprised if there are pauses. Life's running me. the sweet, low-slung Angus tank who lives the next road over. If my calculations are correct, Buck should be pushing 11 or 12 now. He's still throwing nice calves. Here are some of this spring's progeny. The gray one belongs to beautiful gray Betty. Here she is, backlit. I think the Warren's cattle are the prettiest cattle around, with the best-managed pastures. Although the Fleeman's Limosins are ravishing, come to think of it...I am a card-carrying cownoisseur. Buck's still just as nice a guy as ever. I stopped on a sunny afternoon last week to visit with him. He had been scratching his forehead and brisket on a rough post and was up nice and close to the road. There's something I like about touching a multi-ton animal who could, if he wanted, annihilate me, something I like about knowing that he enjoys the contact as much as I do. A few strands of prickly wire separate us. I scratch his forehead and tell him what a magnificent, good boy he is. I tell him how much I like to see him and how beautiful his new calves are. I ask about the little red cow I always see him with but he's not talking. He snorts, sending a spray of flobber over me, and shakes his head. I could reduce you to a spot of grease. Don't forget that I am a bull, a very big one, a dangerous one. Mean. Unpredictable. Slobbery. Pffffuuuuf. Yes, I know. I'm flirting with death. You are a highly dangerous bull, and I have received your warning. But I still love you. And next time I come I will have an apple and some carrots with me. photo by Phoebe Linnea Thompson. Thanks, honey. Well, all right then. You bring me an apple, and we'll talk. I have taken dozens of pictures of Buck in his many moods, but this is my favorite so far. I like to think he's remembering Dale.